Meet Christina Ude SDP 2019 Aspirant For House of Reps, Oru East, Orlu and Orsu Imo State. 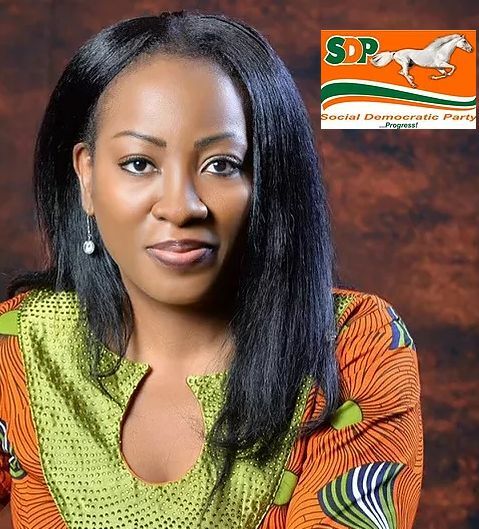 Christina Ude is the bonafide member of Social Democratic Party (SDP) after the primary election by the political party, to represent the good people of Oru East, Orlu and Orsu Federal Constituency at the Green House come 2019. 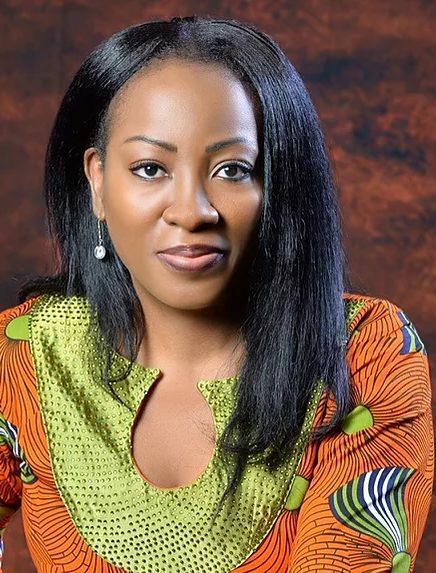 Christina Ude was born in Butte, Montana USA to a college Professor and a former high school principal, both from Amuka-Amiri, Oru East LGA in Imo State. Her parents moved to the USA in the late sixties to attend University. They traveled a lot, and lived in three different continents before settling down to live in Maryland USA. In her early teens, Christina and her family relocated back to Nigeria after spending three exciting years in Berlin Germany where she attended 7th and 8th grades at Marie Curie Oberschule, then later finished up high school in Imo State, Nigeria. Christina says that living in different parts of the world, and attending schools with students from over 20 different countries, not only make her value and celebrate all people and perspectives, but inspired her to appreciate the opportunities we have in Nigeria and to work to make it a better country for all. In 2000, she received a Bachelors degree in accounting from the University of Maryland University College and later earned a Masters in Human Resources Management from Middlesex University. Immediately after her first degree, her first real job was at First Union, now Wells Fargo as an accountant. She worked in this capacity for about three years, and learned a great deal about how the federal government functions and fails to function within the financial institutions. She then worked in a public school as a geometry teacher in one of the high ranking poverty schools in Prince George's County for two years. As her leadership and experience developed, she ultimately became a Snr accountant at Electronic Data Systems, in Rockville Maryland where she supervised new staff and she served in that position until 2008. She also ran a small tax business in Bowie, Maryland from 2004-2008 known as Ciel Tax Accounting Services. Motivated by her ability to change the lives of other young girls and boys, in the summer of 2009, Christina founded Curefo Reading Foundation; an organization dedicated to improving reading and promoting literacy in Nigeria. In 2011, the name of the non profit organization was changed to Reading Hamlets - a name that better reflects its purpose. Since she started Reading Hamlets, she has learned a lot about the power of service above self. Her passion for education lead her to the United Nations to contribute to the ZeroDraft of the outcome document for the UN Summit to adopt the Post-2015 Development Agenda. She eventually delivered the education response to the Zero draft at the United Nations intergovernmental negotiations on the post 2015 development agenda that took place at the UN headquarters in New York on June 24th, 2015. Over the past decade and a half, she has worked in a wide variety of professional capacities in both the private and public sectors. She's currently working at the Nigerian House of Representatives as a Sustainable Development Consultant. She wants to put her experience and qualifications to work for the people of Oru East, Orlu and Orsu. Christina Ude is a highly qualified, hard worker who will serve her constituencies with distinction. She wants to wield the power of government to help regular people -- to be a voice for the people completely ignored in our current political climate. Orlu, Orsu and Oru East need a representative who is an advocate for the people. 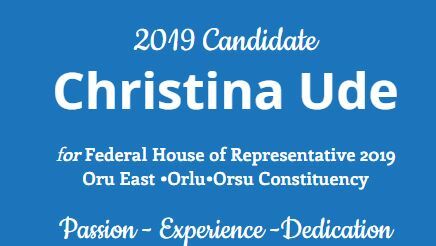 Christina Ude is the best qualified candidate to replace the current Representative for Orlu, Orsu and Oru East at the House of Representatives in Abuja. A good education, clean water and the opportunity to succeed; that’s what all people deserve and she is here to work with you in the fight for Sustainable agriculture, environmental reform, public education reform and responsible job creation. As your legislator representing Imo's three federal constituencies, Oru East, Orlu and Orsu, she will bring a background of varied experiences to this race. She will be your voice in Abuja that insists education is a human right. Her background in education means she can restore accountability to our local schools and will work to fulfill your hope for a better future. Christina Ude is married with two children. I'm running for House of Representatives, for one one thing, for generations that will come behind me, my kids and my future grand kids. I never thought I would get into politics, but after seeing the negligence and the way some legislators have treated such an important position in our government, I decided to run. Over the past few years, I have grown so tired of seeing the our political elite, half baked graduates and the wealthy take over our country. The House of Representatives was always meant to be a collection of regular Nigerian citizens elected to go to Abuja and represent their respective constituencies in National Assembly. With that in mind, I have decided to stand up and be the VOICE of the regular people. My campaign strategist said to me that I need two things in order to run a political campaign: people and money. "You can use one to build the other, but you have to have at least one of the two." I told him that I am more concerned about number 1 than number 2. 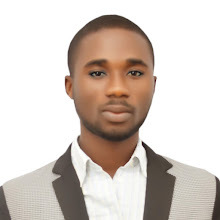 We’ve got really big and solvable problems in Imo State. Making my constituencies better means addressing poverty, ensuring kids have an education, increasing access to clean water and power, dealing with the rising cost of food, and talking openly about youth empowerment, and so much more. Is there a state level solution to everything anywhere in the world? Probably not. But I’m resourceful and If there's a way, I will find it. I’ve always been eager to get better and do more. This led me to seek and earn internships when I was in college, campaign experience when current New York Mayor, Bill de Blasio ran for his first term, volunteer with Rotary International and the United Nations. It’s really time to change the way things are currently being done, to change our dialogue. It’s time to have a Representative who will fight for you. I’m asking you to support me to represent you, your family, and your future in the House of Representatives. This election is about who is going to listen to you and put you and your family first so I humbly ask that you help me with this endeavor. I look forward to getting to know you and earning the right to serve you. Christina's top issues are Imolites' issues and the only way to fix them is to send leaders like her to National Assembly. In National Assembly, I pledge to work diligently toward bipartisan measures that enhance economic opportunities, promote investment in infrastructure, and return jobs to our constituencies. National Assembly needs to focus on measures that empower people to earn living wages which will strengthen our economy and our nation for generations to come. Women still face many obstacles to overcome in the fight for equality. It’s high time we have a representative in National Assembly that will stop ignoring half of the population and the struggles women endure every day. As your Representative, I will work to ensure that women’s rights are addressed in Abuja. Adverse effects of global warming are a reality that must be addressed head on. So, I promise and plan on supporting legislation that actively combats global warming and climate change, and renewable energy to sustain our community well into the future. Imo's agriculture should be a big driver of our economy- with so many farms across the state and and so many farms across Nigeria. It’s important to me that we invest in better technology for small scales farmers and big scale farmers across my constituencies. Imolites have a right to drink, fish, swim, and paddle waters that are safeguarded from pollution. Imo has clean waters that need and deserve protection. Unfortunately, too many pollutants have impaired our waterways, fueling toxic algal blooms, threatening public safety. Our businesses depend on clean water, we depend on water. Water is the source of life and where there is no water, there is no life. This is why I promise and plan on supporting legislation that actively ensures we protect our water and wetlands which are an important link in Nigeria's ecosystems.